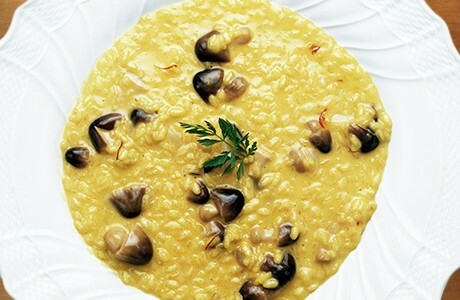 This risotto is infused with fragrant saffron giving it a distinctive colour and delicious flavour. Mixed, wild mushrooms and hot beef stock give a rich depth of flavours to this dish. Sauté the chopped shallot in a saucepan in 25 g of butter and 1 tbs. of extra virgin olive oil. Add the chopped mushrooms and flavour with some parsley, a clove of garlic, salt and pepper and then cook for 20 minutes. To make the risotto: Sauté the chopped onion in a heavy bottomed saucepan in 50 g of butter until softened. Add the rice and fry well until transparent. Add the wine and saffron and simmer until it has evaporated. Add a ladleful of the hot stock and simmer. As the stock is absorbed add more stock when necessary. Continue in this way for about 16 minutes. Add the mushrooms and Parmesan and stir.